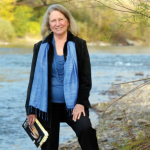 Author and philosopher Kathleen Dean Moore will join concert pianist Rachelle McCabe in a moving and powerful presentation on the theme of freshwater extinction. Their collaboration on this issue began when Rachelle heard Kathleen speak about climate action. Together, Kathleen and Rachelle became convinced of the power of music and words to convey the message of a call to action. “Frederick Nietzche wrote that we have art in order not to die of the truth,” Kathleen says. “This performance is art that allows us to tell the terrible truths about global warming and mass extinction, in a way that enters into peoples’ hearts, rather than breaks them.” Both the creative process and the performance are unusual, maybe unique. Rachelle chose the music, Rachmaninoff’s Variations on a Theme of Corelli. Kathleen has written a compelling narrative to the music, weaving words into the silences between the variations, creating an echoing conversation, a call and response. I was deeply moved by the power, eloquence, wisdom, urgency, and insight of the presentation. The synergy of the music and the reading was brilliant. Why? Because there was such integrity in the sharing of voices. The symmetry between the two of you was magnificent. The Rachmaninoff piece (and the performance) was stunning and your language (and delivery) sent me to so many different places, mainly emotional. And that’s what I needed. Not another intellectual experience, but rather a revitalization of the emotional connection to the planetary emergency.